Heading north from Los Angeles, the first of the Santa Barbara area beaches you will reach is in Carpenteria. (Rincon is technically in Ventura County, part of California Tourist Guide’s Los Angeles area, so it isn’t considered in that calculation.) The state beach there allows camping, and amenities include restrooms, showers and bike rentals. The beaches here are superb, but like all Santa Barbara area beaches, you can get some tar on your feet – so plan on wearing sandals and you may also want to bring some baby oil (for removing the tar). Carpenteria Shores has some great beachfront vacation rentals available if you prefer a more luxurious vacation in this area. In Santa Barbara itself, there is East Beach and West Beach, both of which face south. East Beach has loads of amenities – restaurants, volleyball, beach rentals, even a zoo! Parking can be a problem, but you can park a few blocks away and walk. West Beach is a bit mellower and has great views of boats coming and going. 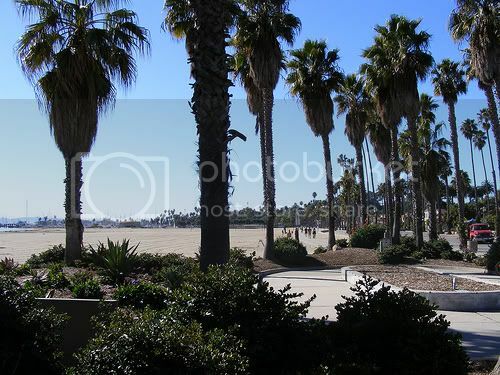 While both of these Santa Barbara beaches have a broad range of beachfront hotels, ocean-view motels and inexpensive inns, in our opinion accommodations around the West Beach area offer the best value. Along with the good variety of accommodations available, the Santa Barbara City College campus is adjacent and the wonderful walking paths of Shoreline Park are nearby for your enjoyment. It should be noted that because Santa Barbara faces south and the nearby Channel Islands create a bit of a seabreak, you are not as likely to find as good surfing conditions in this area as you will elsewhere on the California coast. If you seek a surfing vacation, Santa Barbara beaches are not your best choice. Arroyo Burro Beach, also known as Hendry’s Beach, is only a couple miles up the coast, but it might as well be worlds away — very secluded, quite beautiful and a lovely place to hang out. Parking can be an issue, though, so come early. The next few miles are surprisingly desolate and hard to reach, but the reward for your efforts is Goleta Beach County Park and the beaches next to the University of California, Santa Barbara. Goleta Beach offers fishing, picnic areas, volleyball, good parking and a nice restaurant. Refugio State Beach and El Capitan are wonderful swimming beaches. There is little else to do and no amenities, however, so bring everything you need: food, water and sunscreen. Gaviota Beach (and State Park) is where the highway turns inland and leaves the coast, and beneath a train trestle is a parking lot and pier perfect for walking or fishing. It’s small and remote, but worth a stop before you leave the coast. Photo of Santa Barbara Beach by Chris Isherwood back soon via flickr (Creative Commons).